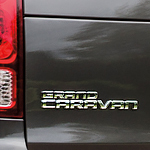 The Dodge Grand Caravan is a versatile minivan that is designed with the needs of a family in mind. There is plenty of seating room for your family, your friends and your pets. The Grand Caravan is also designed with plenty of storage room so that you can take what you need on a trip. The Dodge Caravan has a storage bin behind and under the third row of seats. This is a convenient place to keep things out of sight. The rear seats can be folded down to provide more space when you need to haul something home from the hardware store. An overhead bin for storage is available as well. If you are looking for a versatile vehicle that is suitable for your family, come test drive the Grand Caravan at Chilson's Corner Motors of Cadott as soon as possible. Sales professionals are available to help you learn more about this vehicle.